Riesling by Howard Park of Great Southern. . Howard Park is internationally feted as one of the new world's great Riesling wines, achieving superstar status after claiming highly coveted gold medal at the prestigious London International. Riesling is both demanding and sensitive, Howard Park's success is due to a strict inclusion of nothing but the best batches free run juice, for wines which can demonstrate great potential to evolve beautifully and show marvelous complexity. Howard Park Wines has a very simple mantra when it comes to the production of its wines - premium wine can only come from excellent fruit. Since its foundation Howard Park has held the belief that each variety is best suited to particular climates and soil types within the two premium wine regions of Margaret River and the Great Southern. Howard Park are only ever produced in very small quantities, but are noted for their rare balance of elegance and power with a proven history of ageing with increased complexity and interest. Over the years, Howard Park has exerted considerable effort into defining and classifying the vineyards in these two regions by variety to ensure the quality levels demanded are continually upheld and improved. We believe this approach ensures that each bottle of Howard Park wine is the finest expression from these two regions and continues to over deliver on your expectations. 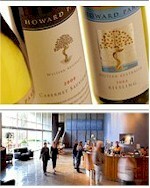 Howard Park is driven by a simple philosophy; premium wine can only come from excellent fruit. Howard Park is committed to Western Australia’s premiere grape growing regions of Margaret River and the Great Southern. Commited to sourcing the very best fruit from specific vineyards and in many cases specific blocks. Committed to traditional winemaking skills, the use of new French oak and careful blending procedures to ensure perfect harmony is achieved. Howard Park embraces modern technology whilst employing traditional wine making techniques and produces internationally recognised wines of the highest quality. During vintage, the winemakers drive over 26,000 kilometres testing, selecting and carefully monitoring the fruit. Amongst the growers, Howard Park has earned a reputation as being tough, rejecting more fruit than what is accepted. Howard Park Wines has been based at Denmark, a small coastal town located within Western Australia’s Great Southern region, since its inception in 1986. Home of Madfish Bay and situated 450 kilometres south of Perth, the coastline at Denmark and along to nearby Albany (50kms east) rates among the most beautiful in the South-West. With its numerous vistas of towering native eucalyptus, karri, marri and jarrah trees and beautiful Bays whose chilly winds blow all the way from the Antarctic, Denmark provides the playground for fishing, surfing, swimming, snorkelling and boating. Since the 1980s this former timber town has grown steadily supported by new agricultural, horticultural, tourism, arts and crafts, and conservation-based industries. Today Denmark is the centre of a thriving, diverse community that is proud of its unique environmental heritage. A charming country town with a population. Howard Park's newest winery is located just outside the small town of Cowaramup, the birthplace of what is now the Margaret River Wine Region. In 1988, the undulating, partly cleared land was an attractive but run-down sheep farm which was originally part of the West Australian Government Group Settlement Lots issued to pioneering families to develop agriculture in the 1920s. Howard Park’s Margaret River cellar door and wineworks now sit in the middle of the estate and are accessed by one of two winding entries both lined by Birch trees amidst the vineyard. The winery stands on top of a hill on the most elevated point of the Leston Vineyard and is flanked by tall marri and karri trees and commands impressive views over the vineyard and Wilyabrup valley. The fully functional winery has been widely acclaimed for its award winning architecture incorporating feng shui principles with contemporary Australian design.